And climate change could be to blame. Strange zig-zags have formed across Lake Thingvallavatn in Iceland. Bizarre images of neat geometrical patterns on a frozen lake in Iceland have locals and visitors scratching their heads. The other-worldly markings, first noticed by a local resident, stretch almost 2 kilometres across Lake Thingvallavatn in Iceland's Thingvellir National Park. Park official Einar AE Saemundsen took photos of the phenomenon and posted them to Facebook. The lines have never be seen on the lake before and have stirred up some conspiracy theories on social media, with alien interference being a popular theory. But park officials say there is a much more earth-bound -- and more likely -- explanation. Park official Einar AE Saemundsen said that the weird phenomenon initially stumped park officials, who had never seen anything like it. "Speculations started and there was no shortage of alternative explanations from alien activity and unknown monsters in the lake to strange conspiracy theories," Saemundsen told the media. "Scientific explanations came from experts that recognised this as a very rare phenomenon called finger rafting," he said. "But it is not known to have ever been seen before at Lake Thingvallavatn." Finger rafting has been previously recording in the Arctic and Antarctica, but never on Lake Thingvellir -- until now. Finger rafting captured off the Antarctic coast. The unusual occurence happens when ice sheets collide, but instead of one sheet sliding over or under the other, the two sheets interlace, forming rectangular protrusions usually about one metre wide. It can only occur in ice sheets less than 10 centimetres thick and the sheets also have to be the same thickness. According to Thingvellir National Park's Facebook post, the ice on Lake Thingvallavatn has been becoming thinner over the past 15 years due to rising air temperatures, which could explain why these patterns are appearing on the lake for the first time. "The lake has gathered partial ice cover for shorter periods and [is] more unstable," the Facebook post read. "For the past couple of weeks a thin ice has been on big parts of the lake." The rare formations are expected to disappear within the next few days, however if you're planning a visit, there's no shortage of other incredible natural wonders to see at Thingvellir. Check it out below. Thingvellir National Park is stunning all year round. 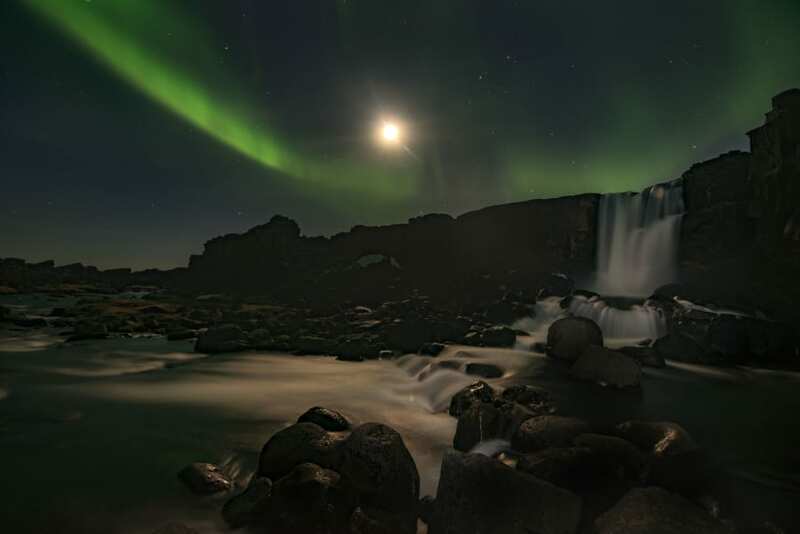 The Northern Lights are often visible at Thingvellir National Park from April through to August each year.